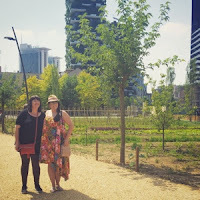 Whilst visiting the beautiful city of Milan last month, courtesy of Friends of Glass, we dinned in the most amazing restaurant on our last day. 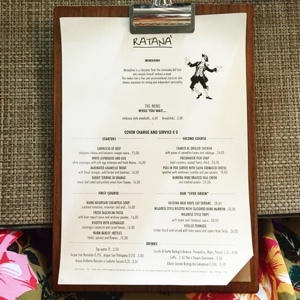 Ratana Milano is based on the outskirts of the city, a short cab ride from the centre of town (costing around €10). he restaurant has an ethos close to my own heart: it sources only locally produced ingredients. As you can see from the below pictures, the restaurant's vegetables are grown right outside their doorstep. 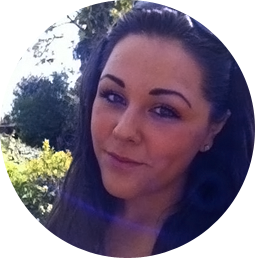 If visiting in summer I'd recommend booking in advance to secure one of the few tables overlooking the gardens outside. With menus presented in both Italian and English, we found it hard to choose just one dish each (so I went for two!). 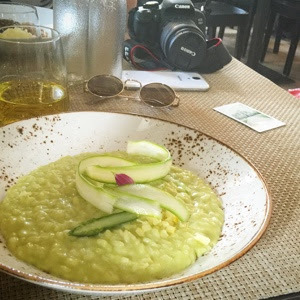 Classic Italian dishes such as beef carpacio and fresh water fish soup are served alongside seasonal choices such as 'peas in a pod served with salva cremesco cheese, anchovies and pea sprouts' - a stunning selection. 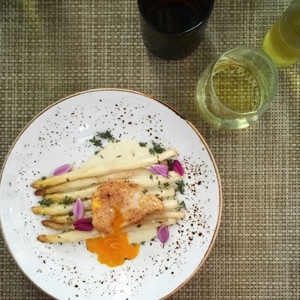 I ordered the prettily plated white asparagus to start which was served with a breaded poached egg and fresh thyme. Although simple, this was the best dish I ate in Italy. Fresh and flavoursome, it tasted as good as it looked. 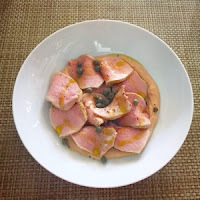 Vitello Tonnato followed this, which consisted of tender pieces of veal served with a tuna sauce and Sicilian capers. I had planned to eat veal before my trip, and was beginning to become slightly concerned as this was our last meal in Milan and I hadn't yet had the opportunity to order it. The meat was extremely delicate, with its flavour enhanced with the saltiness from the tuna and capers. It was a bit too much for me to finish, but I'd always prefer to have too much than too little. 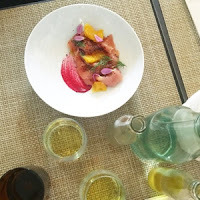 My fellow dinners, including Zoe London and Claudia Bach, ordered the trout with blood orange and fennel (which I must admit I didn't try) and the Asparagus Risotto, which contained a vibrant mix of asparagus carpaccio and lemon zest - utterly refreshing on a sunny day. 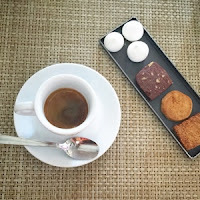 We ended the meal with a coffee, which is served alongside a tray of mini desserts, and a walk through the gardens. 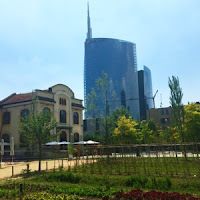 If you're visiting Milan, you HAVE to visit this rustic restaurant, it really was the highlight of my trip.